(Chapel Hill, NC) – Orange County, through its Lands Legacy Program, on January 4 acquired a 26.5-acre tract from Trinity School of Durham and Chapel Hill for $130,000 to complete a long-sought protected land corridor from Duke Forest to the Orange-Durham County line. The NC Ecosystem Enhancement Program (EEP) provided the funding and will hold a conservation easement on the property. Triangle Land Conservancy (TLC) was instrumental in the deal, negotiating with Trinity School for several years in order to reach this agreement. TLC also was responsible for bringing the EEP preservation funding to the project. Trinity School was a true conservation partner in the deal, acquiring one tract from a private seller then packaging it with its own land to enable this crucial New Hope Creek corridor linkage. The newly conserved land sits sandwiched between two other Orange County Lands Legacy Program parcels on New Hope Creek. To the north is a 22-acre tract purchased at a bargain price in June 2006 from Wade and Carolyn Penny (also in partnership with TLC). To the south is a 1.1 acre tract at the Durham County line purchased in 2005. Immediately adjacent across the county line is land conserved by Durham County, which also owns land along the New Hope all the way to US 15-501. Only a handful of tracts in Durham County remain to connect the corridor all the way to Jordan Lake, the ultimate goal of the 1991 New Hope Creek Corridor Open Space Master Plan. Upstream, about 2,200 acres of the New Hope corridor between NC 86 and Erwin Road is conserved by Duke Forest and TLC’s Johnston Mill Nature Preserve. Like many conservation deals, this was a complicated transaction and required a full conservation partnership with the seller, Trinity School. In this case, Trinity School purchased a crucial 16.6-acre tract to make the deal work. The school then subdivided that tract and recombined 10.8 acres of it with another 15.7 acres (subdivided out of a 19-acre tract already owned by the school) to create the 26.5-acre conservation property. The school had been using the land for science education and nature study, and plans to continue doing so. This deal leaves just two pieces of unfinished business for conservation of the Hollow Rock area of New Hope Creek. One is the balance of payments still owed to Duke University for 43 acres on Erwin Road. The other is an anticipated conservation easement with Wade and Carolyn Penny on about 30 acres, a deal complicated by virtue of the land lying in both Orange and Durham, necessitating the Pennys to negotiate with each county. Those projects not withstanding, conservation partners have now protected 101 acres on New Hope Creek at Erwin and Pickett Roads. 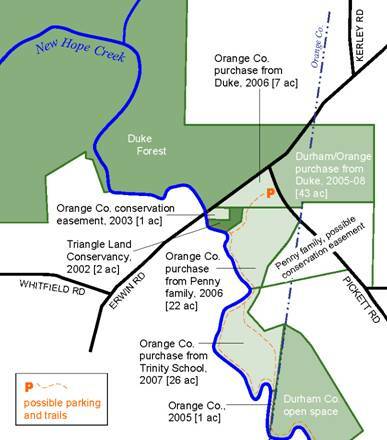 This includes the 43 acres of Duke University land which is currently being purchased by Durham and Orange counties (to be completed in 2008); the 22-acre Penny family tract now owned by Orange County; a 7-acre triangle of land at the corner of Erwin and Pickett roads purchased by Orange County from Duke in February 2006; 2 acres owned by TLC; the 1-acre tract at the Durham County line purchased by Orange County in 2005, and a 1-acre conservation easement held by Orange County. All of this lies directly across Erwin Road from one of the entrances to Duke Forest’s Korstian Division, which encompasses about 1,900 acres on New Hope Creek. TLC’s 296-acre Johnston Mill Nature Preserve is separated from the Duke Forest land by one small tract. With the conservation acquisitions and conservation easements work nearly finished, the partners can now turn their attention to developing parks and greenways. A master plan committee for the Hollow Rock Access Area portion of New Hope Creek will begin work in the next few months. This access area will provide low-impact recreation opportunities in the Hollow Rock area as well as future trail connections to the north and south. Eventually a New Hope Creek trail will connect Duke Forest to Jordan Lake. Triangle Land Conservancy is a private, nonprofit group that conserves important open space—stream corridors, forests, wildlife habitat, farmland and natural areas—to help keep our region a healthy and vibrant place to live and work. TLC’s 64 protected sites in Wake, Durham, Orange, Chatham, Johnston, and Lee counties encompass more than 9,000 acres, including several preserves open to visitors year-round. TLC is primarily funded by individual contributions and memberships, plus grants from foundations, state government and corporations. Orange County’s Lands Legacy Program works to acquire critical natural and cultural resource lands within the County. Administered by the Environmental and Resource Conservation Department, Lands Legacy has protected 1,700 acres of natural areas, future parks, farmland and cultural sites since its creation in 2000, and has contributed to the protection of another 1,000 acres. Lands Legacy actively partners with other conservation agencies and has leveraged over $3 million in Federal and State conservation funds toward these acquisitions.